Everything continues coming up Rock for Dwayne Johnson. Despite not revving critics’ engines as much the last few entries in the series, The Fate Of The Furious went on to have the strongest worldwide debut ever by beating out Star Wars: The Force Awakens. That calls for a Corona. Well, maybe not for Johnson. In addition to producing a “wrestling dramedy” starring Lena Headey and Nick Frost, Johnson is gearing up for the release of Baywatch, starring in an adaptation of Rampage, and probably still trying to get this “Die Hard in China” thing sorted out. His only day off was yesterday so he spent it with his daughter, who’s apparently a big Pikachu fan. You know what that means? Yep, Johnson wore another silly costume. The first time Jasmine’s favorite character, Pikachu came to visit her months ago she was only crawling. 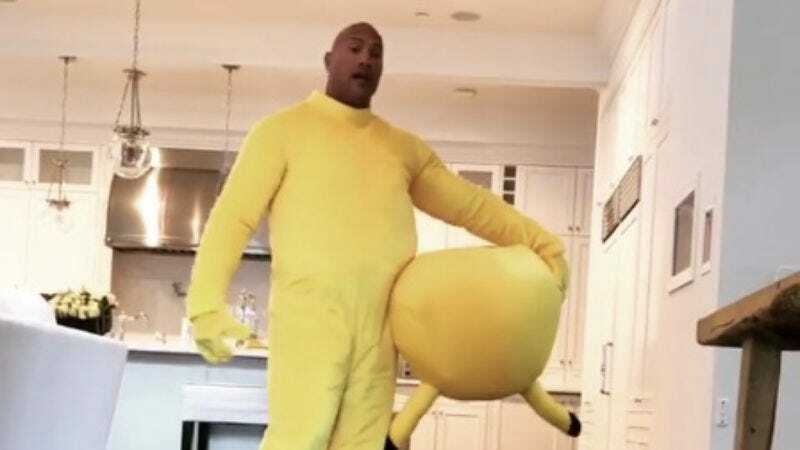 For Easter Sunday @laurenhashianofficial and I thought, Pikachu should make a special visit once again. Well, Pikachu didn’t account for the fact that now Jazzy RUNS and for 2hrs straight she wants to play her new favorite game, “I run away and you chase me Pikachu. And you’re not allowed to take a break until I go night night”. Once the People’s Champ, always the People’s Champ. Some jobs don’t get a vacation.